The .35 Remington [8.9x49mm] is the only remaining cartridge from Remington's lineup of medium-power rimless cartridges still in commercial production. Introduced in 1906, it was originally chambered for the Remington Model 8 semi-automatic rifle in 1908. It is also known as 9x49mm Browning and 9mm Don Gonzalo. Over the years, the .35 Remington has been chambered in a variety of rifles by most firearms manufacturers, and continues in popularity today in the Marlin Model 336 lever-action. It is also a popular cartridge for single-shot hunting pistols like the Thompson/Center Contender and the Remington XP-100. For hunters looking for a good woods gun, (i.e., a medium power rifle with moderate recoil, for short to medium ranges) the .35 Remington is popular, taking second place to the .30-30 Winchester. It has a small but loyal following in the northeast and areas of the southern United States. The cartridge uses a medium to heavy bullet and has moderate recoil based on a moderate pressure level of 33,500 CUP as set by SAAMI. The normal factory load consists of a 200 grain round-nosed bullet with a muzzle velocity of 2080 feet per second. This 200 grain bullet is nearly 18% heavier than the .30-30's 170 grain bullet, and has a 16% larger frontal area. This gives it a substantial increase in power over the .30-30, especially when used on larger game species. Remington helped promote the advantage in power that the .35 Remington had over the .30-30 through a series of advertising campaigns in the early 1900s. One of their advertisements even publicized the ability of the .35 Remington to penetrate a 5/16″ steel plate, which the .30-30 Winchester could not do. The .35 Remington is considered a fine round for deer, elk, black bear, and other medium and large game as long as ranges are reasonable. Hornady currently produces a .35 Remington load in their LEVERevolution line that features a rubber-tipped spitzer bullet which is safe to use in lever action or pump guns with tubular magazines. 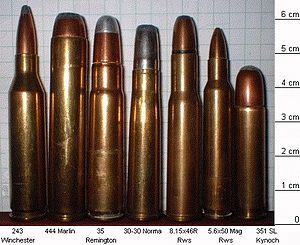 ^ a b c ".35 Remington Accurate Online Reloading Data" (PDF). Archived from the original (PDF) on 2010-06-02. Retrieved 2007-08-13. ^ "The .35 Remington: An Underrated Brush Cartridge". The Big Game Hunting Blog.